T is for Television. Before coming on Thailand golf vacation you can improve your game by mimicking a few things that golf professionals do by watching golf on television. 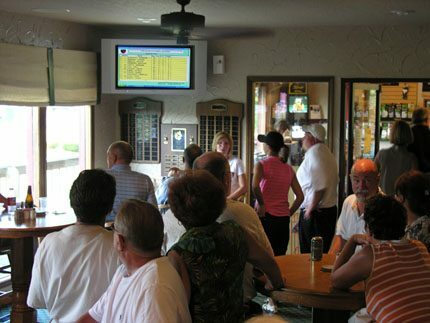 Anyway what better thing is there to do at your club after a weekend round and sipping a few cold ones at the snack shack? Of course watching an entire golf tournament is time prohibitive, as is using your TIVO to view record a tournament and watch each golfers’ swing in slow motion, so try to look for and emulate the following 3 good habits while avoiding one point especially applicable to Thailand golf. 1. I have already covered the pre-shot routine, but it’s worth mentioning again because golfers are always looking for quick and easy habits, and this is an easy trait to copy from the professionals and gain more consistency. 2. The next thing you should observe is balance. Watch how the professionals keep their balance during their swings. In fact let me know if you ever see a golf professional loose their balance and fall over or away from the ball when they swing in a tournament. The reason they never lose balance is because they swing within themselves. Every time I go to a Bangkok driving range, whether it be All Star or the one on Soi 42 I see most of the Thai golfers trying to hit the ball as hard as they can, and having a hard time staying in their golf shoes! Proper balance is finishing on your left side so watch how golf professionals always seem to finish with their right foot right off the ground. 3. Another thing to watch for is how golf professionals twirl the club after the complete their follow through. Mark O’Meara used to do it on almost every shot, Tiger does it quite often, and Jack was the leader in club twirling during his heyday. Why would you want to do this when golfing in Thailand? It’s a sign you’re not holding the club too tightly as you can not spin the club unless you are holding the club lightly. Most golfers in Thailand can not do this because they are trying to kill the ball, the grip, and everything attached to the golf club. Now, one thing you will see that you should not do is copy the bags golf professionals carry. Their golf bags are huge and will not fit on most Thai caddies’ bag trolleys, will be overweight according to airlines baggage regulations, and once you get to Thailand your bag will not fit in the smaller Asian automobiles. The golf professionals carry such large bags only because sponsors pay money to them. I suggest when coming on a Thailand golf trip is to keep your bag as light as possible. There is not need for a staff bag, especially in Thailand. What an embarrassment you would feel seeing a 40 kg girl lugging your big bag around the course while her friends just smile in pity. Leave the staff bags to the “staff”. There are many medium sized bags out there that have plenty of pockets for all your golf accessories. Do yourself, and your caddie a favor, remember the golf professional swing habits, but choose your own equipment and definitely stick with a medium sized golf bag!